Hibiscus leaf teas are a delicious beverage with several known health benefits. The colorful bright tea has been enjoyed across the globe for generations. Hibiscus leaf tea is made from the dried petals of the tropical hibiscus flower. Medical research has demonstrated that hibiscus tea has the ability to reduce blood pressure. The tea also shows promise for treating high cholesterol and has other heart benefits. You can easily incorporate the health benefits of hibiscus leaves into your diet by adding a few cups of hibiscus leaves to your teas. Not Just Tea blends delicious hibiscus leaves in your favorite herbals teas like Sassy Strawberry and Fruit Sangria. 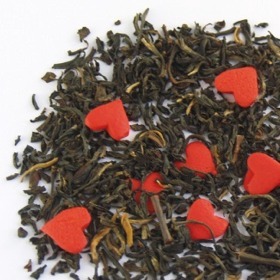 These best selling teas are easily prepared and delicious. Simply add the tea leaves to hot water with sweetener and other ingredients of your choice such as lime, cinnamon, and mint leaves. Let the teas steep for a few minutes until the water is a bright red color and enjoy! Hibiscus leaves can be enjoyed both hot and iced. Whether it is a cool pitcher of your favorite Serenity Blue iced tea or a steaming cup of White Cherry Rose, tea for many people is a way of life. Being the second most consumed beverage in the world, just behind water, tea is consumed in almost every country, on almost every continent. True tea aficionados swear by using loose tea instead of tea that comes packaged in tea bags that are usually made from bleached paper or plastics. Not only does using loose tea save money per cup and cut down on packaging waste, it also tastes better and supposedly contains more antioxidants and other beneficial compounds. To be considered “tea” a beverage must contain leaves and or stems of the Camellia Sinensis tree; otherwise it is considered an herbal or fruit tisane. There are many tea producing nations that each have a unique variety and flavor in tea. At Not Just Tea, we love Japanese, Chinese and Indian teas for their full and rich flavor and unique characters. Since all tea comes from the same plant, what is the difference between the types of tea? Processing! How the tea is processed will determine whether it is a black tea, white tea, oolong, pu-erh or green tea. Flavor of the tea and caffeine content also are determined by the processing method as well as where the tea is grown i.e. soil condition, the time of the picking. Many people do not realize ‘decaffeinated’ means that the tea still contains caffeine, although very little. Regular black teas can be decaffeinated by brewing the leaves for 30 seconds and then straining, after which, brew the same leaves again for the full amount of time. This will yield a slightly lesser aroma and taste, but with 80-85% less caffeine. Those teas marked ‘Decaf” go thru a CO2-decaffeination; the tea leaves are soaked in a carbon dioxide solution, separated, filtered with charcoal to remove caffeine, then re-immersed in the solution to reabsorb nutrients. This process decaffeinates and preserves 95% of the tea’s compounds and flavors with no chemical residue. Note that decaffeinated teas are teas previously with caffeine and then have gone thru a process of decaffeination; they still contain some caffeine. While caffeine-free teas like Serenity Blue are teas that have NEVER had caffeine! Black tea is the most popular tea in North America. Black tea is normally the first tea consumed as children. Who does remember the Lipton tea bag and little piece of lemon that you received at the local restaurant or diner. My first tea experience was black tea. My parent's lived in Flushing, Queens near Chinatown. There was a little Chinese restaurant that they frequented often. Even though I was only 5 or 6, I still remember the piping hot sweet black tea that arrived at the table as soon as sat down. Who would have thought that a few decades after I would create Not Just Tea whose mission it is to create that wonderful feeling that I still remember from my first tea experience. What Makes Black Tea So Wonderful? All true tea types come from the Camellia Sinensis plant; what makes the difference is how the tea is processed. All teas have varying flavors and colors but are processed in basically the same way. Black teas are special because unlike white, green, or oolong teas, the tea leaves are fully oxidized (think of an apple that has been cut and has browned). Leaves are picked either by hand (this is rare and expensive) or by plucking machines. After picked the leaves are laid out to wither and dry. The dried leaves are then rolled between two disks that accelerates that oxidation process. Black teas are fully oxidized which gives them their deep, robust taste and black coloring. Visit Not Just Tea at Sugarloaf - Timonium, MD - April 29 - May 1, 2016! At Not Just Tea, we specialize in unique fruit and flavored white, green, black and herbal teas that are both healthy and taste heavenly. We aim to make drinking tea healthy, delicious and fun!